I'm exporting PSD layers to PNGs for a game's texture atlases. When I'm doing Copy -> New File (RGB 8-bit) -> Save As PNG, the resulting PNG is quite heavy and Finder shows white background instead of transparent. But when I'm using Export Layers to Files (24-bit PNG), the resulting PNG is 70-95% smaller. I don't need any compression by Photoshop - my texture creating software can do it well by itself. But I'd like to export layers by script instead of saving them manually. What makes Saved As PNG that heavy? Do exported images lose any color information or are reduced in quality? Copying 54kb PNG file to Windows XP VM decreased file size to 5kb. OS X Photoshop version adds "com.apple.resourcefork" attribute to file during regular saving. You can see it by ls -l@ filename.png. The attribute is not included in file, but the file system shows total size. The white background from the screenshot seems to appear because of this attribute. 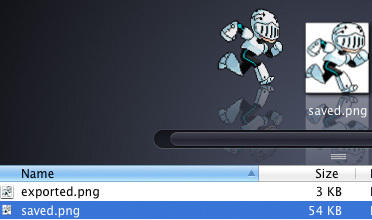 PNGs with normal file size are displayed with transparent backgrounds. Without the attribute the size of PNG is about 5kb. It was reduced to 1.6kb by removing iTXt(870b), pHYs (9b), iCCP (2.64kb) and cHRM (32b) chunks with pngcrush. UPD: I missed "Metadata" option in "Save for Web & Devices" dialog window. "None" adds only 0 Software: Adobe ImageReady to the file. File size reduced from 3.6kb to 2.5kb. When you "save as" you also include metadata as well as hidden application specific data. By using the Export to PNG you strip metadata and any application specific data from the file and therefore get a smaller file size. There should be no quality loss between the two. The primary difference is metadata. I'm not showing any difference in transparency here. Either method results in a 32 bit PNG for me, provided the originating file had transparency. Your'e image above shows Finder/Explorer icon previews. Previews may not have transparency, but chances are the actual image does have transparency. Preview icons are generated from a composite of layers and they do not always translate transparency correctly. But that's only the file preview generated by the operating system in most cases. Not the answer you're looking for? Browse other questions tagged adobe-photoshop layers png export transparency or ask your own question.